Ellie's Dairy - The Finest Goat Milk, from Kent: Masses of milk ..
What a week! 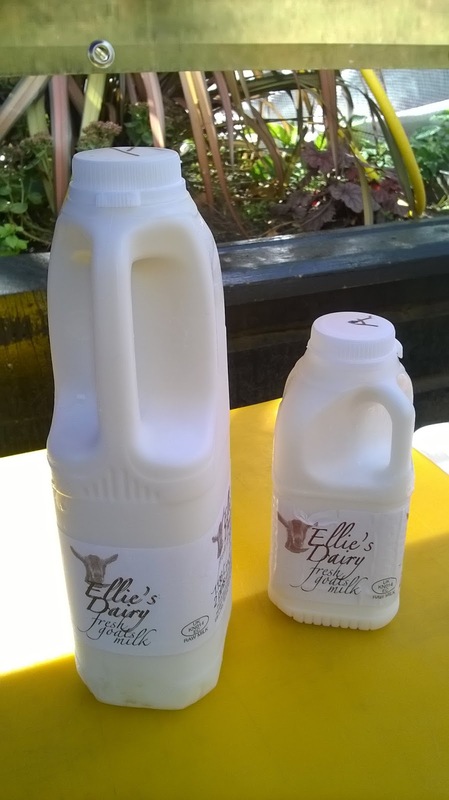 We seem to have been bottling milk constantly this week as there has been so much going on every day .. I just added it all up and we have done a grand total of 863 pints this week. Not bad for a few old goaties :-). That doesn't include all the milk that has gone for cheesemaking, by the way ..
And, just out of interest, we don't have a fancy bottling plant or anything .. every single bottle is filled and labelled by hand. Oh yes indeed ... low tech! Lovingly and carefully bottled, mostly by yours truly but Dairy Fairy Julie had a bit of marathon session this week, as did Dairy Fairy Joe. Well done chaps! And, talking of bottling, you will be pleased to know that we survived our routine Environmental Health visit earlier this week. The lovely ladies from Maidstone and Swale Borough Councils braved the pouring rain and farmyard mudbath to trot along and inspect us closely. Seems that we are behaving ourselves! 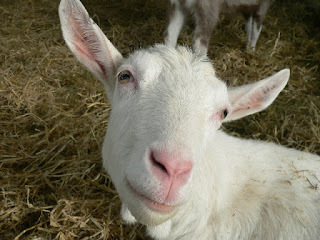 The goatie girls have spent much of their time indoors this week as the weather has been so disgusting. And even when it dried out a little bit, they were still reluctant to get their feet wet. One evening during milking they were all just standing about outside, not wanting to go out in their field. I suggested to David that he should open up the gate to the other field to see if that would tempt them outside .. after all, a field with a closed gate is much more interesting than a field with an open gate! So, here we go ... the noise in the background is the milking parlour running. 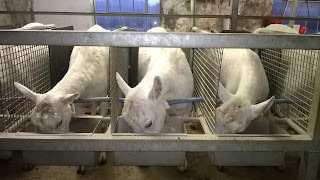 She is one of triplets - Mora, Marlin and Margot. All over 9 years old now and still in the herd. They came from our friend Mary as tiny kids many years ago and have produced masses of milk between them over the years. Tonight they all came into the parlour together, one after the other, and so I had to take a picture for the 'old goat' album! Shame they were all too busy eating to look up for the camera!